Bjørn Nyland is quite impressed with the autosteer feature in the all-new 2019 Jaguar I-Pace. ***UPDATE: We've added video of Bjorn's consumption test down below. Nyland has been testing autosteer/lane keep assist on multiple vehicles. We've seen and shared plenty of videos showcasing Tesla Autopilot, but Nyland has also tested ProPilot in a Nissan LEAF, as well as Lane Following Assist in the new Hyundai Kona. Now, he's had an opportunity to check out the Jaguar system. We've also used the system while driving the I-Pace, so we'll share our thoughts as well. Initially, Nyland seems thoroughly impressed with the autosteer feature in the Jaguar I-Pace. It allows him to keep his hands off the wheel for an extended period of time and keeps the car centered in the lane. In fact, he has trouble getting the technology to warn him. However, on a few occasions, it just shuts off randomly. This could be catastrophic if a driver was relying on it as if it were some type of self-driving technology. With the being said, Jaguar has not billed it as such and has made no claims that this technology matches that of Tesla Autopilot. Once Nyland is able to get the system to warn him, he tries repeatedly to engage it and keep his hands off the wheel. The system continues to warn him and then eventually appears to go into a lockout mode. It will not let him engage the setting and it continues to beep without pause for an extended period of time. When InsideEVs drove the I-Pace in Portugal, one of the vehicles was set with the haptic feedback on. This means that the steering wheel would vibrate every time we drove close to the lane lines. I found the feature helpful, especially when we were on the freeway and attempting to use the touch screen. Being that we were not familiar with the touch screen, we found it to be a chore and often had to pull over to find settings. However, when I did reach over to change a setting and the car moved toward the lane line, the I-Pace warned me immediately. On the second day, we drove a car with the autosteer feature on. Interestingly, we were unaware that it had been turned on, so I was expecting the same vibrating steering wheel from the previous day. I will say that when the car corrected itself it caught me off guard. After that, I was purposely trying to cross the lines on curvy roads when no other traffic was present. The system worked well and would not allow me to go into another lane without force. Unlike Nyland, we didn't attempt to use the feature to actually steer the car with our hands off the wheel. Very important! This test was to see what happens if the driver faints, falls asleep or something similar. For normal driving, you have to keep a hand on the steering wheel. Similar test for Hyundai Kona: https://www.youtube.com/watch?v=OopwA... All the autosteer settings were turned on during the test. 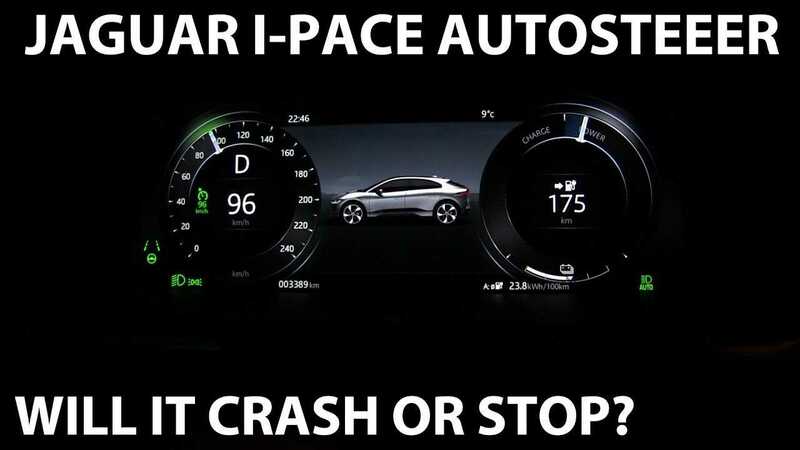 I-Pace has two levels of lane assist. The first level (green lanes) will only do ping pong between the lines just like LKA on Kona. The second level (green steering wheel) will do a much better job of keeping the car centered in the lane. I set it to automatically adjust the course.